When Becky was five years old, she was diagnosed with leukemia. To help her deal with the pain and the treatments, her father, Chris, suggested they create stories about a fantasy land they called Tamarisk. They spent each night coming up with new details and stories about the people and the land, and continued to do so even when Becky was well again. Several years later, Becky's parents divorced and the stories ended. But Tamarisk lived on. Princess Meia and the other people and animals living in Tamarisk grew up and evolved on their own, as Chris and Becky's relationship deteriorated. Then one day, 15 year-old Becky falls asleep at her father's house and finds herself traveling to Tamarisk, meeting Princess Meia and seeing all the wonderful creations of her imagination. 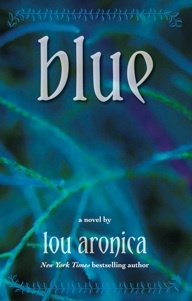 Blue by Lou Aronica is at once beautiful and uplifting, sad and fantastical. It's a story of relationships ~ father/daughter, husband/wife, queen/subjects, friends. It's about facing challenges that seem unsolvable without losing hope. It's about the power of imagination. I loved the vivid descriptions of Tamarisk. I doubt my vision of this land will ever dissipate completely. The amazing creatures, the blue leaves and grass, the melodic sounds of the world. But I also loved the characters. Aronica brings the reader into the lives and minds of Becky, Chris and Meia as they each face their challenges. Despite the fantasy nature of the story, the characters were very real. I cared about them and what happened to them. Blue is categorized as an adult novel, but I believe it would appeal to fans of young adult fiction as well ~ and of course, anyone who enjoys fantasy stories. Read my interview with author Lou Aronica. This review was written based on a copy of Blue that I received from the author in exchange for an honest review. This sounds fantasy or dystopian to me. Glad you enjoyed it, not my cup of tea. Interesting concept. It sounds like an idea from Big Fish only for children. I have an award for you. Congrats :) Here are the details.